Learn how to cook the fast and easy way from the best YouTube cooking channel. Get useful cooking tips and techniques from each “how to” cooking videos. Although cooking is part of our daily lives, it is also an adventure that most of us take for granted. Planning what dish to prepare is not an easy task. There are so many factors to consider such as preparation time, cuisine, occasion, number of servings and more. Thus, we have selected the best YouTube cooking channel that can help you cook like a culinary expert. This cooking channel showcases a variety of quick and simple recipes from basic cooking to grilling. The host, Chef Jason Hill, is generous in giving cooking tips that can help you become a great cook at home. So if you are looking for hearty recipes that can be prepared in a jiffy, then Chef Tips is the best YouTube cooking channel for you. If you have an appetite for grilled foods, then BBQ Pit Boys Grilling Show is your YouTube cooking channel. Here you can find savory barbecue and grilling recipes for outdoor cook-outs like picnics. You will also learn the grilling methods and techniques for different cuts of meat including the best dipping sauce that will complement it. Student Mealz is a YouTube cooking channel hosted by ordinary students. Their recipe videos consist of easy to cook meals suitable for students in terms of budget, cooking skills and preparation time. This fun channel is highly recommended for students and beginners in the kitchen. 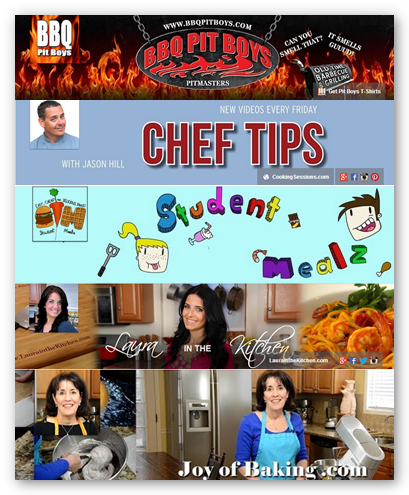 This YouTube cooking channel is hosted by Laura Vitale. It centers on Italian cuisine but since it is an interactive cooking show, you are free to send in your recipe request. Trivia: Laura in the Kitchen app is available in iTunes App Store. No matter how full you are there is always a room for dessert. If you have a sweet tooth then Joy of Baking is the YouTube cooking channel for you. In this cooking channel, you will find recipes of different pastries that will surely satisfy your sweet cravings. Do you want to grab a copy of your favorite recipe? You may use Free YouTube Downloader to download and convert the videos from any of your preferred YouTube cooking channel to your device.